I’ve posted before that I love a pink squirrel. This sweet cocktail is a blend of equal parts cream (or ice cream, if so inclined), white crème de cacao, and crème de Noyaux (also known as crème de noya or crème de almond). Made of apricot kernels, crème de Noyaux takes its name from “noyau,” the French word for kernel, pit, or core. Its red hue puts the pink in a pink squirrel and lends a more interesting flavor than if similarly flavored amaretto were used in its place. Pink squirrels rank high on my list. So does Marshmallow Fluff. (Click over to deLizious Facebook for proof of the fluff obsession.) With two dozen jars of fluff in my pantry (I can only find it on store shelves once a year, folks. Please don’t judge me. 😉 ), I’ve taken The Marshmallow Fluff Cookbook down from the shelf. A recipe for Grasshopper Pie caught my eye and I thought why not crème de Noyaux instead of de menthe? 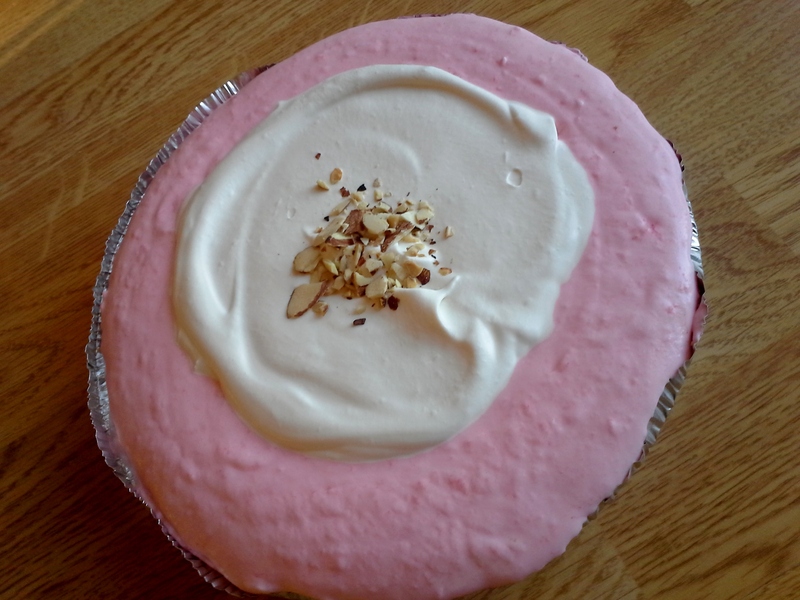 A traditionally mint green pie went pink as I subbed in one liqueur for another. I’d like to say it was an amazing success. Except that it wasn’t. My tendency to play fast and loose with recipes got me into trouble. 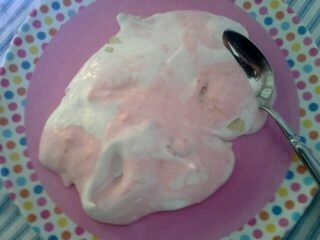 Instead of using gelatin, I used vegetarian gelatin left over from a past project (vegetarian marshmallows anyone?). I also let the gelatin mixture come to a boil, which is for sure a no-no. In the end, the chilled gelatin mixture was a bit gloppy–certainly not the light and airy mousse I was going for. Once folded into the freshly whipped cream, it made a passable pie filling, though it never fully set, so slices didn’t hold their shape once plated. I’ll call it pudding in a pie shell and still enjoy, but will try again another day using regular gelatin and paying more attention when heating the gelatin mixture. 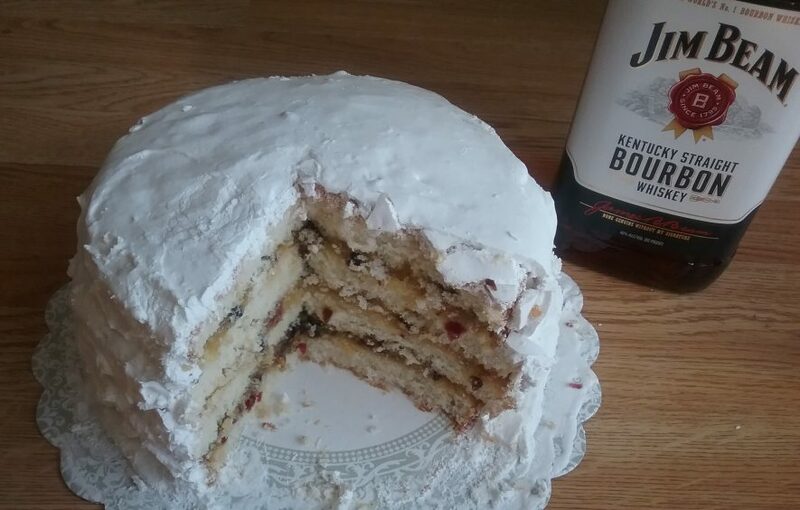 It’s a reminder to me that experimenting with recipes doesn’t always lead to success. Even the mistakes are delicious, though, which is why I’m ok making mistakes in the kitchen. And for the sake of deliciousness, I hope you are, too. Play with flavor by switching out the crème de Noyaux for another liqueur. In medium saucepan, stir together cold water and gelatin; let stand 1 minutes. Cook over low heat, stirring constantly, just until gelatin is dissolved. Remove from heat. Stir in marshmallow fluff and crème de Noyaux. 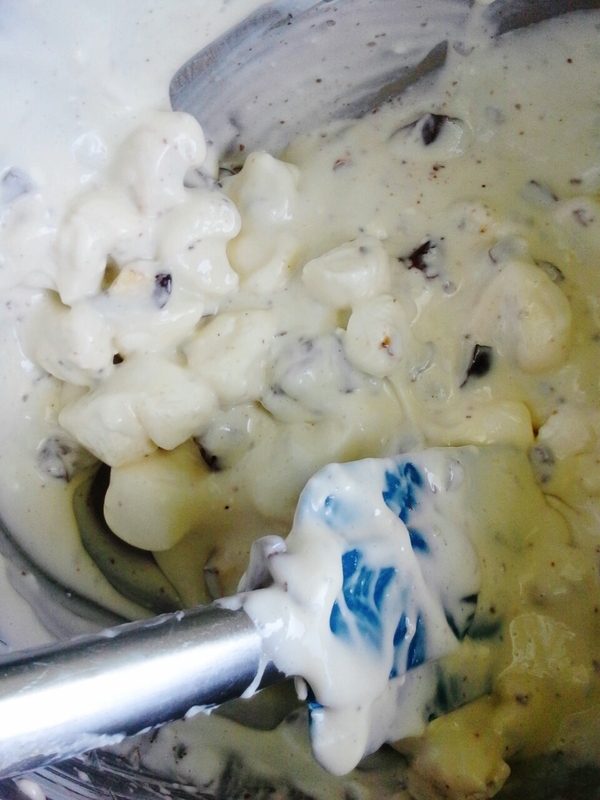 Refrigerate until mixture mounds when dropped from spoon. In large bowl, whip 1 1/2 cups cream until soft peaks form. Fold into thickened gelatin mixture. Pour filling into crust. Top with 1 cup whipped cream; sprinkle with almonds. Refrigerate 4 hours or until set. My husband has learned that when he’s feeling pie-ish, he has to make one. His pie urge struck this week. Our spring rhubarb crop is tall, proud, and screaming to be cut down and baked up. 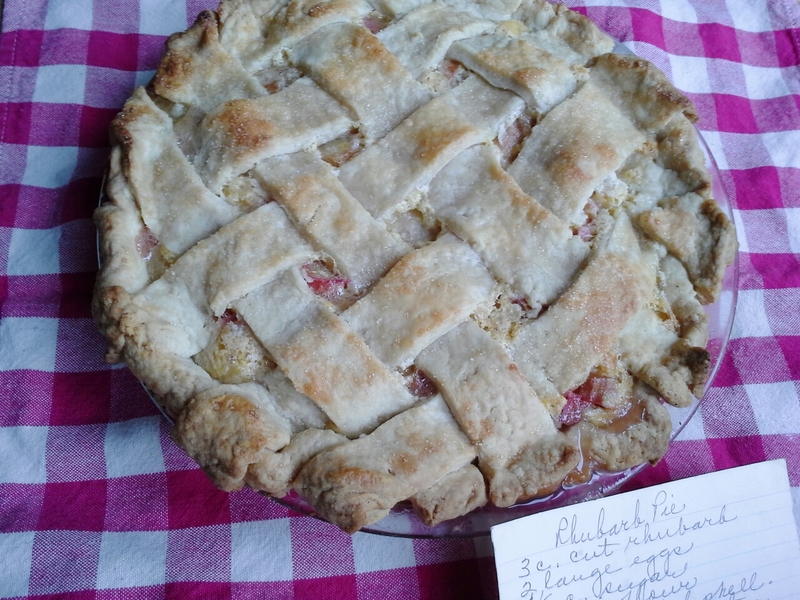 Rhubarb pie time, thought hubby. He dutifully dug out his mom’s recipe and thawed a crust we had in the freezer. (Proof that I’m not a complete Pie-Making Abstainer: The crust was leftover from a two-crust recipe I had mixed up months ago.) Because he wanted to make a two-crust fruit pie, and the frozen crust would provide only one pastry round, he decided to make a smaller pie. A single crust could easily make two smaller pastries. 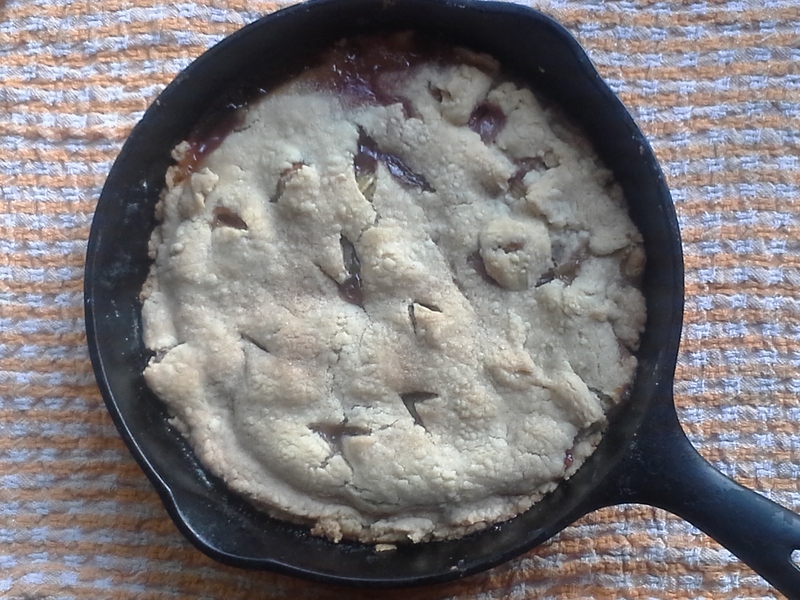 Our mini pie dishes were too small and the standard pie dish too large, so he used an 8-inch cast-iron skillet. Perfect! 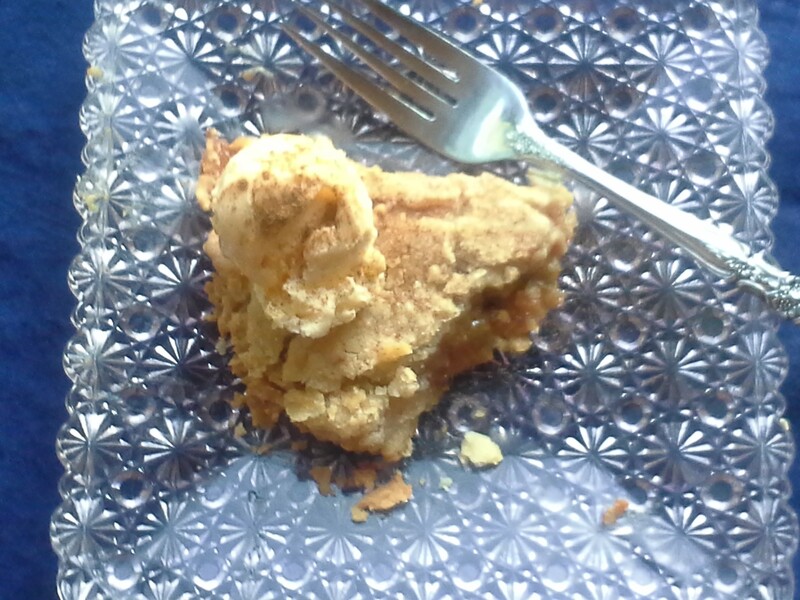 The pie baked up hot and was adorably rustic. 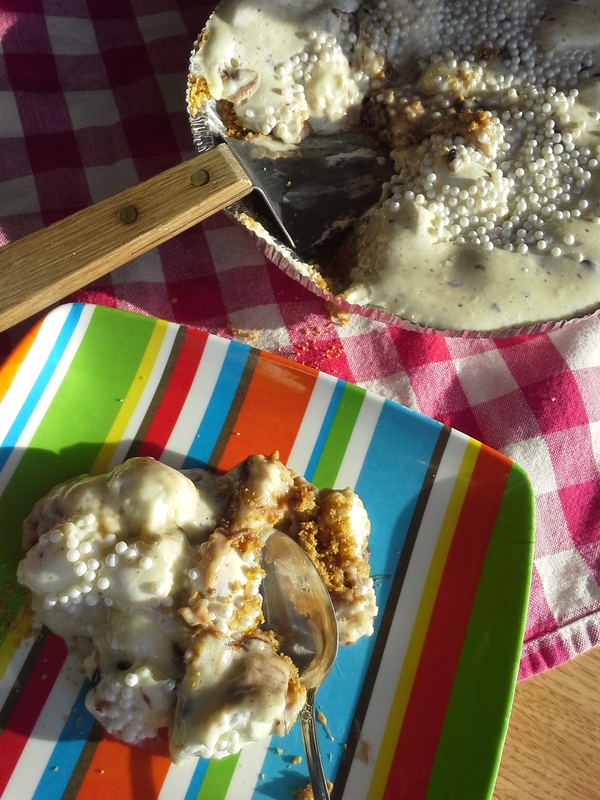 I enjoyed a piece, though for me it was more a vehicle for the à la mode ice-cream topping. A pie purist, my husband didn’t need the ice cream. This mystifies me. Though it means I get his ice cream, so I don’t ask. Roll each dough-half into 10-inch round. Fit one round into 8-inch pie dish, shallow casserole, or ovenproof skillet. In bowl, stir together rhubarb, sugar, flour, and cinnamon. Transfer mixture to pie shell. Cover with remaining pastry round; seal edges. Crimp decoratively, if desired. Cut a few slits in top crust to vent. Sprinkle with cinnamon-sugar. 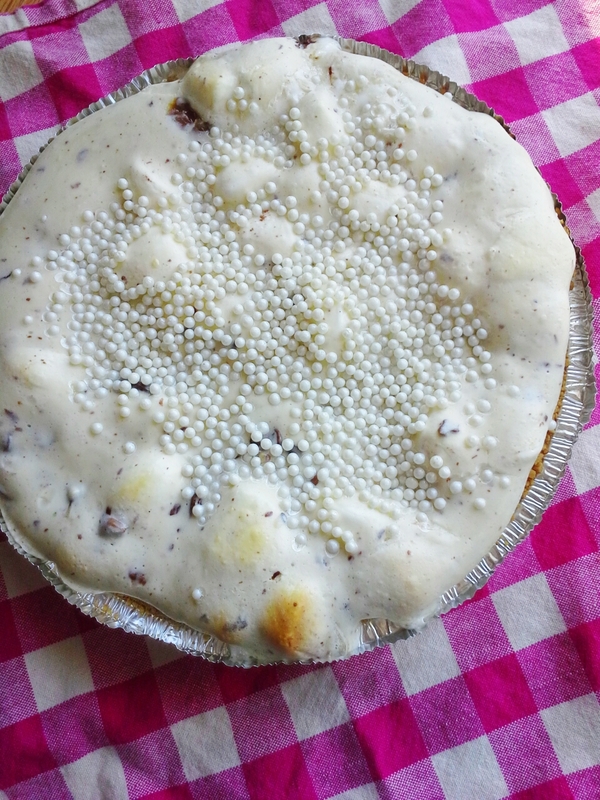 Bake pie 50 minutes or until crust is golden and filling is bubbly. Makes 5 or so slices.